News just in from Eric Trupheme at Ocean Independence of a €400,000 price cut on the 30.5m motor yacht Alisios T.
Built by Arno in 2008 as one of the yard’s Leopard 31 range, Alisios T accommodates up to nine guests in a master suite, VIP stateroom, a double and a twin cabin with a Pullman berth. Twin 1,800hp MTU engines give her a cruising speed of 34 knots. 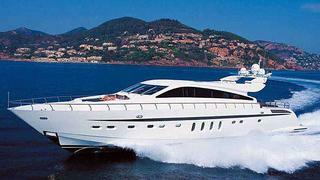 Always privately used and immaculately maintained, her engines have low hours and are under warranty until 2015. Available to view at the Monaco show Alisios T is down from €4.25 million to €3.85 million.